Today, we visited Wacker, another of my favorite falcon sites. 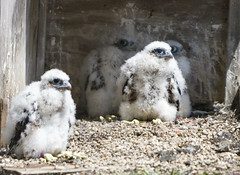 Wacker is the oldest peregrine nest in Illinois, having been occupied since 1988. Because of this, Mary has long standing relationships with a number of people on the engineering staff, so I have to say she always seems very excited to do this banding. In preparation for the banding, I’d spent some time Sunday downloading and printing a number of pictures. Mary had specifically requested I bring the two photos Sean took of building engineer Fred and his son when they visited us at the museum last year. I was happy to do so and also selected two of my favorite Joe pictures and a picture of Rahn and this years chicks. After everything was set up for the banding, I handed the pictures out to various parties. It was neat to see the look on Fred’s face when he saw the picture. He just strikes me as a really, really good dad who loves his son more than life itself. He told me it was the best picture he had of the two of them together. That really made Sean’s day when I told him that later. Soon, Matt was ready to go get the chicks, so we all helped anchor the rope and out he went. It was a big surprise when he opened the door moments later and stepped back in holding … Rahn! Apparently, she’d come down on him a few times and on her last swipe, he’d just reached up and drawn her down into him. I’ve mentioned it before, but it bears repeating — Matt has FAST reflexes. Joel Pond, the head zoo tech for Lincoln Park Zoo and a Chicago Peregrine Program veteran, took the opportunity to draw some blood from Rahn and assess her overall condition. Although Rahn didn’t seem thrilled with this process, I’m happy to report Joel said Rahn was in fantastic health and we did get some blood for Isabel’s genetic study. Joel asked Matt to keep Rahn in hand while we banded the first chick so that he could be sure she wasn’t bleeding at all before we let her go. That meant that I needed to put the camera down and help with the banding — Bonus! I mean, I love taking pictures, I really do, but helping with the banding is a special treat. Our first chick was a male (b/r 17/D) and I gently held him while Mary expertly installed his new leg bands and Joel took some blood. 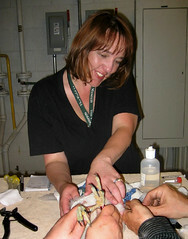 While Joel was taking blood, Mary conspired with Karen to take some pictures of me helping with the banding. Over the past years, I’ve gone to about 13-14 bandings. If I can quickly gauge from the nesting history charts, I’d say Mary and Matt have done over 80 bandings. I’m not sure about Joel, but his number is right up there. With this many bandings under their collective belts, the existing team works like clockwork and I am the last person to ever want to mess with a good thing, especially when it involves interacting with wildlife. SO, I’ve really decided to go to bandings based on whether we had adult identifications from that nest or not. When the team takes the chicks from the nest, both parents usually come in to protect the area, so this provides me with an excellent opportunity to get those bands. On those occasions when I haven’t been occupied with other tasks, I’ve taken the opportunity to get pictures of visitors to the banding and the team at work. I’ve actually only been called into action to help with the actual banding a handful of times, including this one. So, that’s why Mary had someone record this rare occasion – I’m glad she did! The second chick was also a male (b/r 18/D). 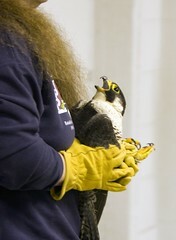 After the second chick was done, Joel checked Rahn, gave her the all clear and Matt set her free on the ledge. Matt, such a sweetheart, let me finish helping instead of jumping in, so I got to hold the two remaining females (b/r 10/E and b/r 11/E) for their banding. And just like that, Wacker was done for another year. After we put the chicks back out, I took one moment to take a picture or two of the reunited family before shutting the door to the ledge and leaving them in peace. We’ll find out from the building what names they like and I’ll post them when I get them! Our chick count now stands at: females (12), males (9). Males are catching up! ~ by Steph on June 1, 2009.